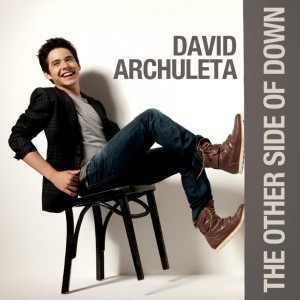 “Falling Stars”, Track 6 on “The Other Side of Down” was met with mixed reviews by record critics and fans when the album was released in October of 2010. Some felt the song was irrelevant to the central theme of the album. Others thought the song wasn’t believable for David to sing because he wasn’t old or experienced enough. Still others dismissed the song as a departure from the optimistic lyrics we have come to expect from David’s music. And then there were those, including me, who fell head over heels in love with the song. When Eman gave us a snippet of the song in a bubbletweet a month before album release, it may have sounded tinny and inaudible but it was love at first listen for me. I’m drawn to love songs, especially those sung by the most angelic voice in the universe. The bubbletweet immediately captured me and made me yearn for the full song. That tinny-sounding bubbletweet got 23,755 views! “Falling Stars” begins with a relaxing tone and builds as it progresses until it reaches a very emotional pinnacle at the chorus after the bridge when David sings “like fallling starrrss” and “like crashing carrrs.” On the album version, you can hear a slight buzz in his voice throughout the song, giving it a dream-like quality. The steady drumbeat during the song is reminiscent of the sound of a heartbeat which perhaps was intentional. It breaks my heart as he tells the story of a love that can never be. I believe him because unlike anyone I have heard, he is able to sing with the emotional maturity of someone who has actually had the experience even if he hasn’t. It’s part of his genius. His refrain from using vibrato at the suggestion of Eman gives the song an unusual quality, one that fits the sullen mood of the song. He ends the song with a relaxed tone again, and brings us back down to earth. “AHAHAHA I remember my dad turning to me asking me ‘Are those high notes even possible? Why my interest in “Falling Stars” now, almost three years after its release? I never stopped loving the song. I always wished for radio play and I don’t think it ever got the recognition it deserved. 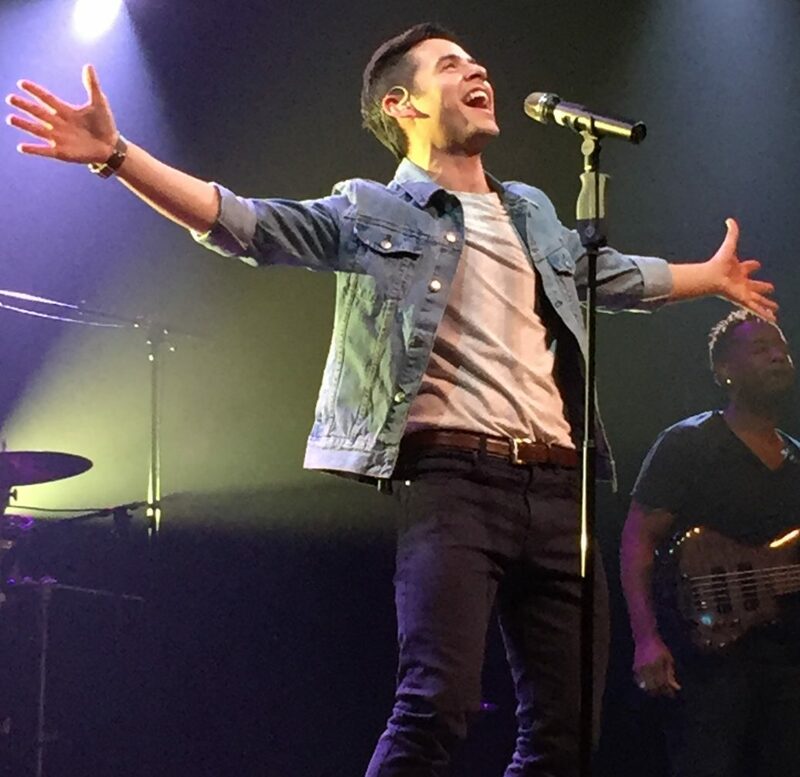 But a recent comment on The Voice by Emmegirl prompted me to dive into YouTube when she pointed out that there has been renewed interest in some of David’s music as evidenced by very recent comments, even on videos that are not live performances. 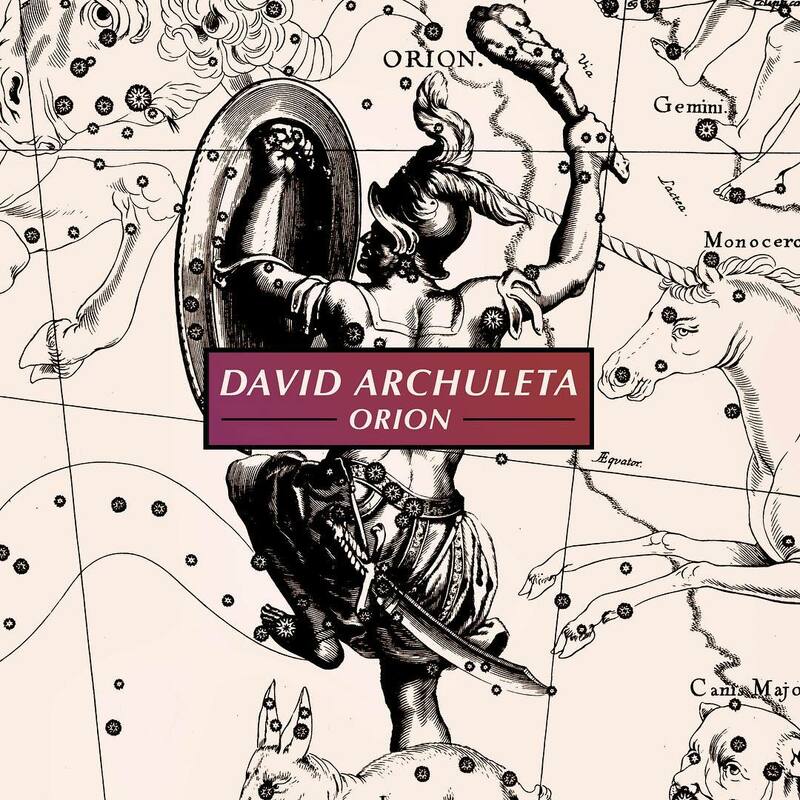 I chose to investigate “Falling Stars” and was encouraged to find brand new comments praising the song, especially since David has been out of the country for almost two years. I saw from the comments that I am not alone in my admiration and fascination for this song. I’m sure you’ve noticed that David has specific body language for each song he performs. Check out the angst he portrays in this live performance of “Falling Stars” from Wichita, Kansas. ‘Cause you are so beautiful, yeah. David’s use of his falsetto in “Falling Stars” is perhaps the highlight of the song for me. My heart skips a beat as his voice glides effortlessly from falsetto and back again, as if he is crying from the deep pain he feels about this doomed relationship. In the above interview, he describes his own feelings about the song. It really added a more mature…it kind of has like an umph kind of manly kind of vibe now, and I think that was what Eman was trying to do. It’s not about showing me and reflecting me, but…I felt like it was okay to have one song that was just a genuinely truly amazing song. I think that song is one of them. 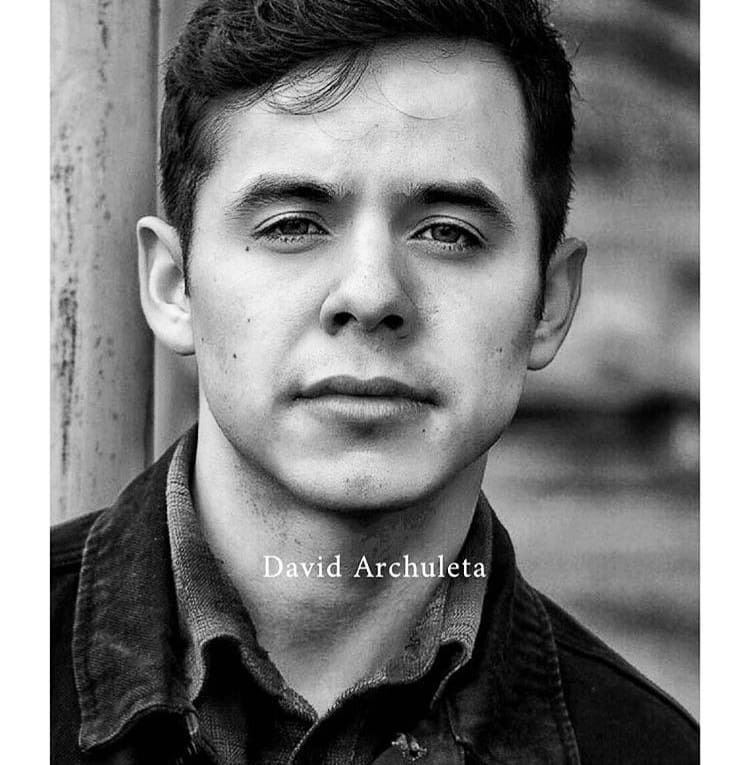 This entry was posted on Saturday, September 21, 2013 at 12:55 AM	and is filed under @DavidArchie, @kariontour, lyrics, The Voice. 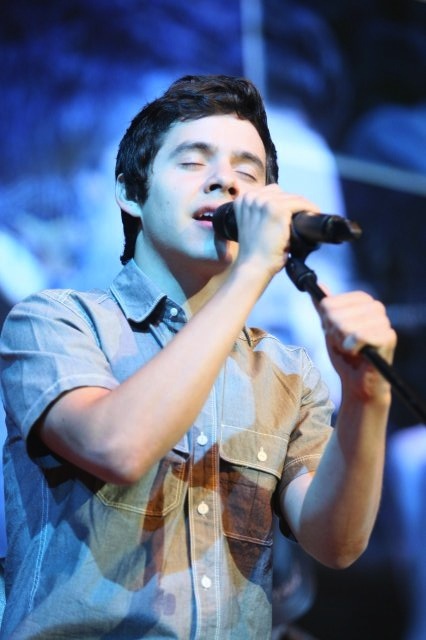 Tagged: #DA2014, David Archuleta, Falling Stars, feeling his voice, Never Over You. You can follow any responses to this entry through the RSS 2.0 feed. You can leave a response, or trackback from your own site. I love “Falling Stars” too. I think it could have been a hit on the radio. Bebe…thank you for sharing your thoughts on this song. David says >>> “I felt like it was okay to have one song that was just a genuinely truly amazing song. I think that song is one of them.” I agree. While this isn’t my very, most favorit-est song, I truly do find his execution of it remarkable. Eman led him well. And, it comes back (it always does) to the 6-7 year-old question– why didn’t this song make it. I agree that it really is a radio song. I definitely wouldn’t switch stations if it came on, like I do with a couple of the current female performers (they shall remain nameless). SB– did you make it home? Thanks for a great post and for sharing those comments. I’ve also noticed that many of David’s videos have recent comments. I’m hoping that means he has a lot more fans out there than we think, waiting for him to get back home and back into music. You called it “hauntingly beautiful”. That’s a perfect description. David’s voice, singing this song straight and pure, reminds me how delicate and fragile the heart is and how easily broken. 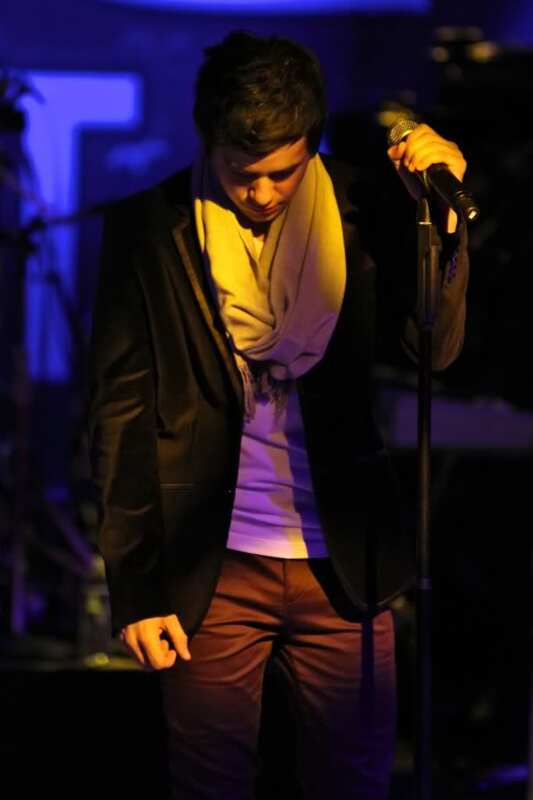 I love how he manages to sing it with such sincerity and tenderness, yet with such power and passion at the same time. I adore love songs and Falling Stars is really beautiful one. I, too, think it should have gone to radio. Bebe, yes another great song by David that never got anywhere. That is what I am hoping that will change when he comes back. That he and his songs will get their glory they deserve! He is just too brilliant and his voice is too good to be passed over! Here’s hoping the American public will wake up and start to appreciate some good music for a change. I’m happy to say that I was at that concert in Wichita and every time I hear him sing that song, it brings back memories. 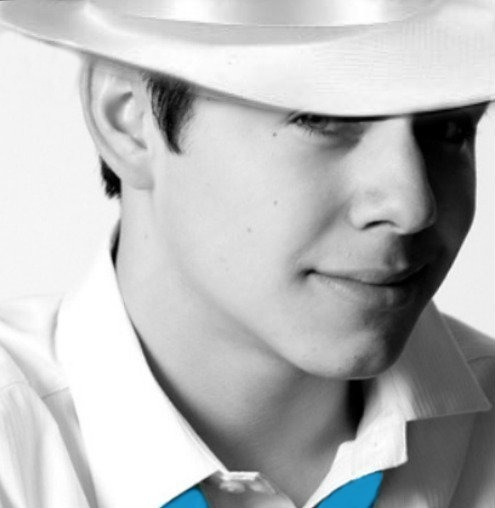 Actually, there are good memories from all the songs I’ve heard him sing live! 🙂 That’s what makes David so special, giving good memories, and I have a lot of them! Oh my, I think I’m really missing him right now and maybe not making any sense…. Bebeeeeee! I too love/loved this song from the start. Brilliant suggestion to David, to sing it “differently ” ..giving it that “manly kind of vibe” as David put it. Our guy does angst, like nobody else. nobody. ♥he’s so brilliant. Tell us, Eman….How does it feel to write for, and work with,THE most brilliant interpreter of lyrics,and music ever?? Love that “emotional pinnacle”, brings me to my knees when he sings that part. David does have different body language for different songs. That performance in the Clear Channel video stopped me dead on my tracks when I first saw it. Yes. Because of the way he was moving. It was new. It was the physical interpretation of the emotion in the song done by David in a way I hadn’t seen him do it before. I remember thinking “I can see the pain of loss in his movements”. And yes, it was…manly. Falling Star is one of my fav song. “Aaaah. What do I say about this song, the song that made me cry the first time I watched David sing it from a Youtube vid with a lot of screamy background noise and the unruly moshpit crowd with girls being lifted and carried out every now and then by concert security? Imagine if there were none of those distractions happening in the video, and everything was just purely David’s angsty voice belting out a heart broken by the thought of being forgotten? I must have been already dead from multiple heart-stopping lines that struck the very core of my previously wounded soul. And the memory of that wound was brought to life with such force by the intense emotion of Falling Stars. I remember that I kept repeating that YT video to discern the lyrics of the song, and every time I deciphered a line, I was dredged in tears. I have not experienced a song that has affected me as much as this song has. was in the minority of fans who loved the song, but to my surprise it was the most downloaded track of the album when TOSOD came out on Itunes. I guess the appeal of the song is its universal theme of the pain of love that has been lost but cannot be forgotten. It may be a song in the album that is most unrepresentative of who David is, but it showcases David’s impressive ability to interpret the song with such credibility even without having had the experience himself. Eman wanted him to sing it differently, sans his signature vibrato, so that he wouldn’t sound like himself but as somebody else. David did do as he was told, even if his voice is so distinctly David, by doing a nasal slur to the words much like Maroon 5 or The Fray does with their own songs. It made the song sound more current and very relatable, like any guy singing his heart out. 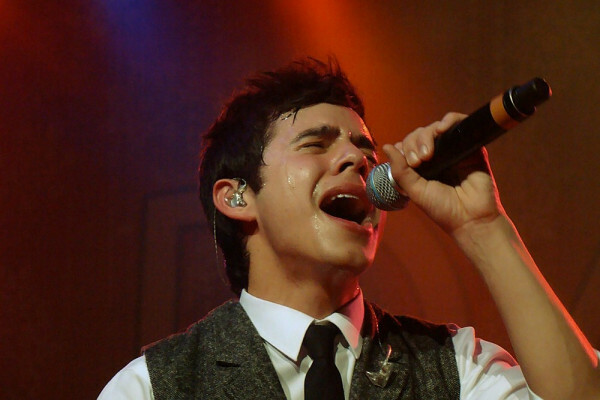 Now combine that with the so-called powerful ‘cry’ in David’s singing voice and the longing in the lyrics. Bamm! Such intensity! It hits hard when you have experienced the pain yourself, and I believe there are many of us who have experienced that pain in their lives. I am torn to bits by the bridge: “When it’s all said and done I’ll be just a speck in the galaxy, floating farher away by graaa-vityyy.”(Oh, that tremor in his voice again!) “Tell me it’s not possible the way that we could break… like Falling Staaaars..! like crashing caaaars..!” I’m just typing it and my eyes are welling up in tears! I love Falling Stars and my favorite video may be this early morning voice live performance on Good Things Utah w/ just piano accompaniment. Thank you all for reading and commenting. I had this article on my mind for a long time. Unfortunately, I never heard David sing “Falling Stars” live since he didn’t have a full tour for TOSOD. I hope he keeps the song in his repertoire because it’s a favorite of many fans and one where he sings his heart out about a love so deep, he just takes my breath away. 2. Suzy – Radio doesn’t know what they’re missing. FS has a very current sound. I don’t listen to radio anymore but while shopping in a store, I’ve heard songs that are similar to “Falling Stars” piped in on the speakers. But none with as beautiful a voice. I think I would flip out if it ever came on radio now. What are the chances? I have to add that he also sings it with much vulnerability. At one point in the Clear Channel video I can hear his voice crack like it did at the end of "Love Me Tender" from AI. It's such an honest sound for that song that I wouldn't mind if he made the "crack" part of the song. 5. Jans – Glad you made it back home safely. And you make perfect sense in everything you say! 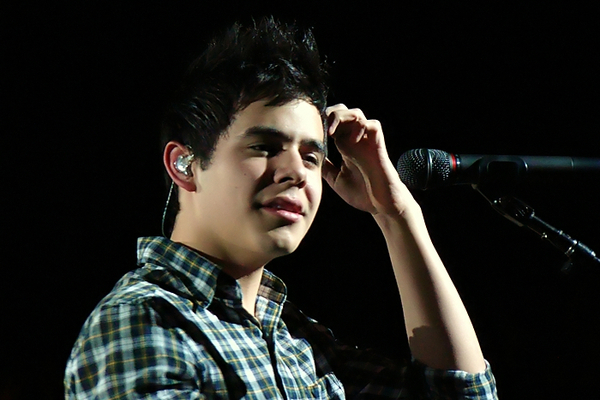 Whenever I play the Wichita FS I think of you in the audience. It must have been magical! Bebe, I love your attention to detail. You’ve included everything about this song that makes it unique and special. 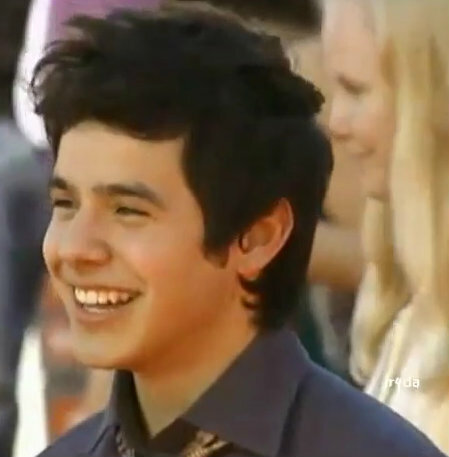 Including David’s adorable rambles. Makes me love him/it all the much more. 6. Sky – I agree; I think David loves performing “Falling Stars” since he said it’s a “genuinely truly amazing” song.” I would love him to collaborate with Eman again. I enjoy all the songs they wrote together including “Nothing Else Better To Do”. 7. Gayle – Glad you commented on the Wichita performance. I love the way he raises his hand to show the stars but my favorite part is at 3:00 when he goes to the very edge of the stage and sings his heart out. “….over you, never over you ’cause you are so beautiful. Yeah.” PS The Clear Channel video stopped me in my tracks too! I constantly played it on YouTube. Still do. 9. Ascphil – My soul sister! 🙂 So happy you’re back, especially since my article was the catalyst that brought you! Your descriptions of the song were so close to my heart that I got chills from reading your comment. Thanks for the info about Falling Stars being the most downloaded song from TOSOD on ITunes. That means it’s more loved that I thought. “It may be a song in the album that is most unrepresentative of who David is, but it showcases David’s impressive ability to interpret the song with such credibility even without having had the experience himself.” That’s his genius! Like you, the haunting melody really gets to me EVEN in the piano cover. 11. Violet – Thanks for bringing the videos of your favorite “Falling Stars”. I had a hard time choosing them for this article. They are all so good. 13. Djafan – Yes, he was dressed to kill when he was on Regis. I loved that performance but was disappointed that they cut it off at the end!! I saw that you tweeted this article to Eman! Thank you! There are 565 signatures so far but we need more to top last year’s card. The site is quite large (huge!) with 5 years of comments and video links, photos, etc. So it took a while to move it. I have to commend my server guy who did an amazing job with it. If any of you ever need a server guru, let me know and I’ll hook you up. If he can move TDC with all of its crazy links and literally thousands of posts and close to 100K comments, he can do anything! Bebe – I am also a fan of Falling Stars – I love when he reaches for those impossibly high notes, I love when he goes from the slow ballad at the beginning to the jumping rhythm in the middle and I love the low notes at the very end. A true showcase for that gorgeous voice. Missed you last night! I’ve lost count of how many times we’ve watched NA and have come to the conclusion that we will watch until the cows come home….uhmm..well until David comes home, anyway. LOL As long as there’s a demand for it, we’ll just keep going. I can’t imagine what it takes to move a website but I’m sure TDC is in capable hands under your control, Marlie. :). Here’s pocoelsy’s newest video creation! Twitter spazzing!!! There will be DATES!!! 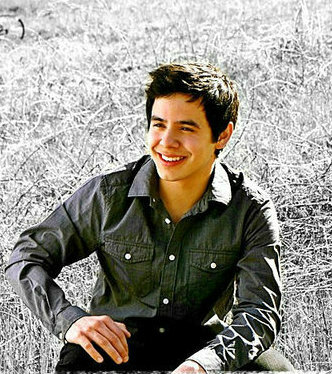 @Marylee_NCGirl @pocoelsy1 @DavidArchie @kariontour ME TOO!!! 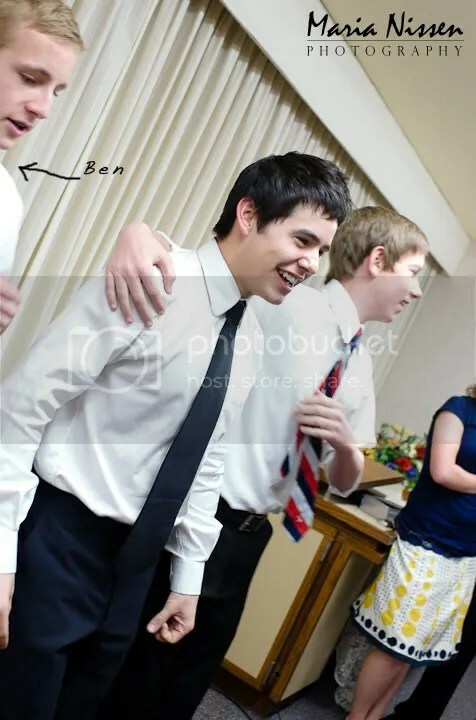 @ZeeNnGT @Marylee_NCGirl @DavidArchie @kariontour Me three !! Gosh imagine if today is the day that tomorrow D will b back !! 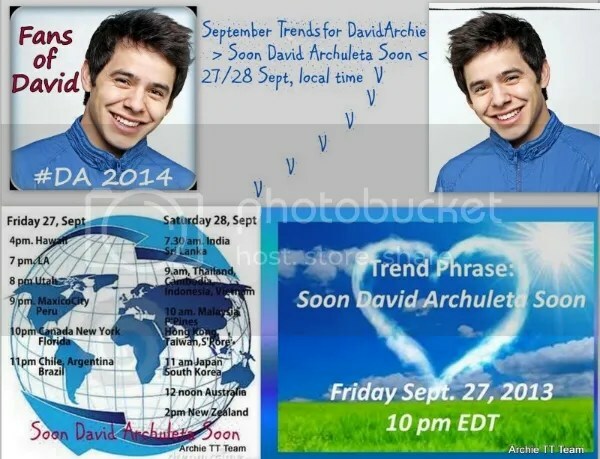 @pocoelsy1 @Marylee_NCGirl @DavidArchie @kariontour Question is, will he let us know his arrival date? sure hope so! 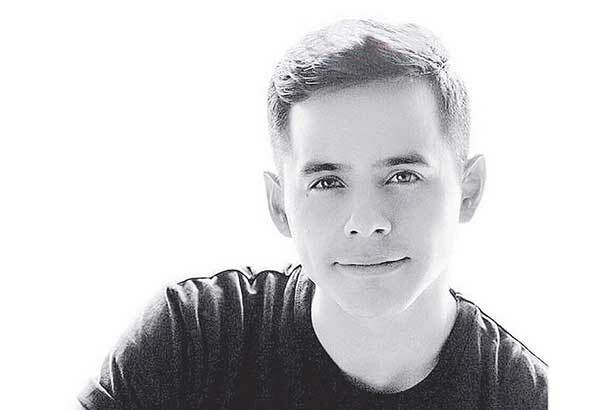 @ZeeNnGT @Marylee_NCGirl @DavidArchie @kariontour hope so too but I dont wanna get my hope up !!! sometimes he’s unpredictable!! 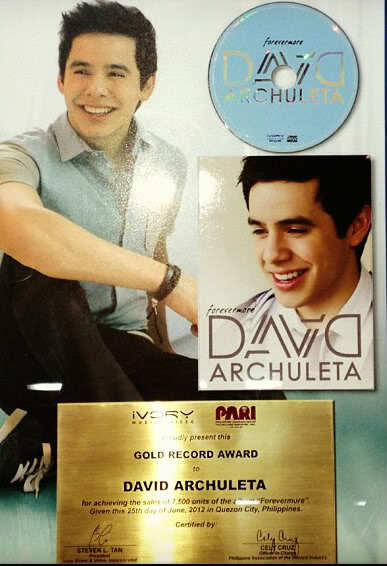 @pocoelsy1 @Marylee_NCGirl @DavidArchie @kariontour True. It’s highly possible our humble guy might want to keep a low profile on that day. @ZeeNnGT @pocoelsy1 @Marylee_NCGirl We all know how private he is. Think of his feelings at that time not yours as a fan. @ZeeNnGT @pocoelsy1 @Marylee_NCGirl that means he would like it to be private thing with his family and close friends only. @ZeeNnGT @pocoelsy1 @Marylee_NCGirl Save it for the first date of his first show back! Trust me there will be dates! Anyway… I loved the song and what he did with it from the beginning, so I am so very glad you did this article!! Thank you so much! I see glimpses in the comments and they all look delicious! But I am on a diet this week…. TONS of work!! From @kariontour: Trust me there will be dates! @kariontour @ZeeNnGT @pocoelsy1 @Marylee_NCGirl YAY 4 dates! I need dates asap 2 request vacation, book hotel & flight…so much planning! Woo Hoo! Dates!! Dates!! Dates!! I had forgotten all about the bubbletweet! But now I recall the excitement that swept over the fan base when it was teased on twitter by Eman. We had been in a long drought as David was still in the writing and recording phase of TOSOD. It sounded like a tiny piece of heaven 🙂 The best thing to come out of all this is the beautiful live performance videos we are able to watch. Falling Stars is in my top 5 from the CD. This was posted on twitter by Pocoelsy. HAHA! Abrra, LOL Love Poco’s pic. hahaha I think I am that little spotted one in the middle. 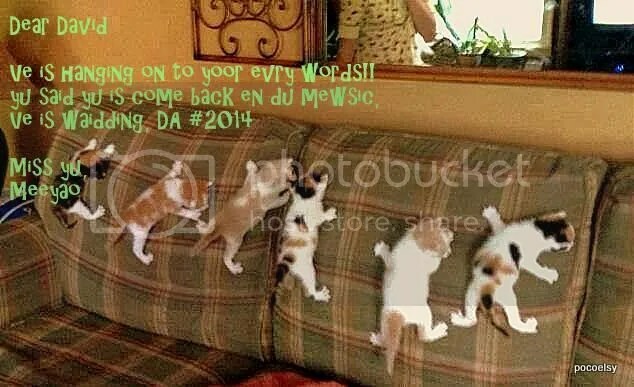 Hanging on for dear life and looking straight ahead toward #DA2014! Did Kari really say that? WOW! Sounds harsh to me. Bebe, I was never a fan of Falling Stars….until now. You have won me over. My favorite is the one on Good Day Utah. It beats the others for me because the ending is just exceptionally fine. Of course the one on Regis actually had no ending but even so, neckwise that performance really shines. Those scarves are just not for me. Loved Jans comment about David giving us good memories. Boy, that is what this is all about. So many wonderful times to look back on while he is wandering around in Chile. 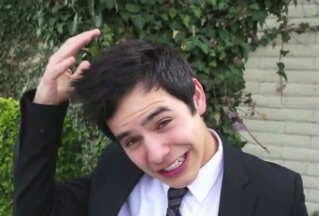 I could watch Adorkable David all day long. Thanks for bringing that, dja. You have happied me up today. Had a great time with the gang at Nandito Ako last night. You are all so much fun to spend an evening with. Bebe served her signature popcorn and then surprised us with fancy cups for our beverages. She is so clever. Those cats are crazy. We know just how they feel, right? Just hanging on until “there will be dates”. Yayyy!! Bebe, every time I hear Falling Stars I think of you. You and that song are one lol. I know you loved it from the start. that night, the snow was falling like mad, but it was beautiful. There we all sat, catching up and laughing. have been a huge hit. I just know it. Also, we have a new kitten and I found myself falling madly in love with him. We ALL have. I never expected it. I was always a dog person. together, it’s the cutest thing ever. She licks and grooms him like his mom would have. She has the patience of a saint. Well, trust me, if there aren’t dates, there won’t be a career. I agree, Abrra, but perhaps it was in the choice of words and not the feeling behind them that was harsh. I also agree with Kari, that he needs that time with family at the beginning and have always felt so. Bebe, you know how I fell in love with Falling Stars, right from the first. It is such a beautiful song of heartbreak. I love the lower register and the reaching for those high notes, the plaintive cry. The doom. So stinking beautiful. Why can’t every song be this “genuinely truly amazing?” I don’t really care if his work is reflective of his true self or not, so long as it reflects a universal condition. I don’t think anyone out there can touch David in singing power ballads of love found and lost. Still hoping for a cover of One someday. Remember how he teased us unmercifully with it? Remember when we sent him a long list of requests for the whole song and Bebe delivered it? Sigh. Well, we live in hope. How did I get off of Falling Stars? Oh well. Here is what he gave us of One. Love. Have we all seen this beautiful video yet? “I’ll Be Waiting” written and sung by Aaron Paul, the composer of Nandito Ako. Tissues required. This then led me to other videos — of course — and came across Aaron’s English version of Nandito Ako. He explains this is not a translation but another version. Lovely. Wouldn’t it be nice to hear David sing this too? 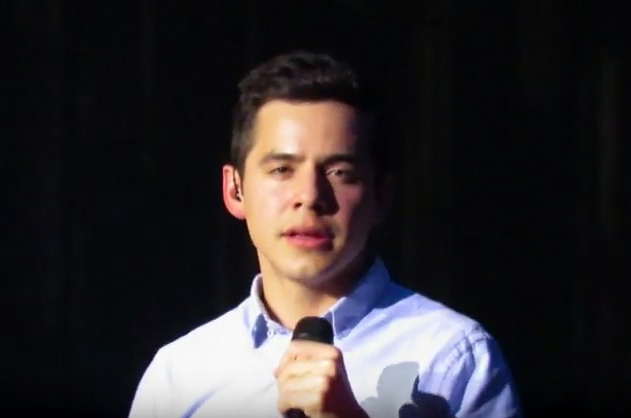 Continuing on, I ran into a video I hadn’t seen before where David is singing Nandito Ako and it seems the NA crew is all there – also spotted Kari with her camera. 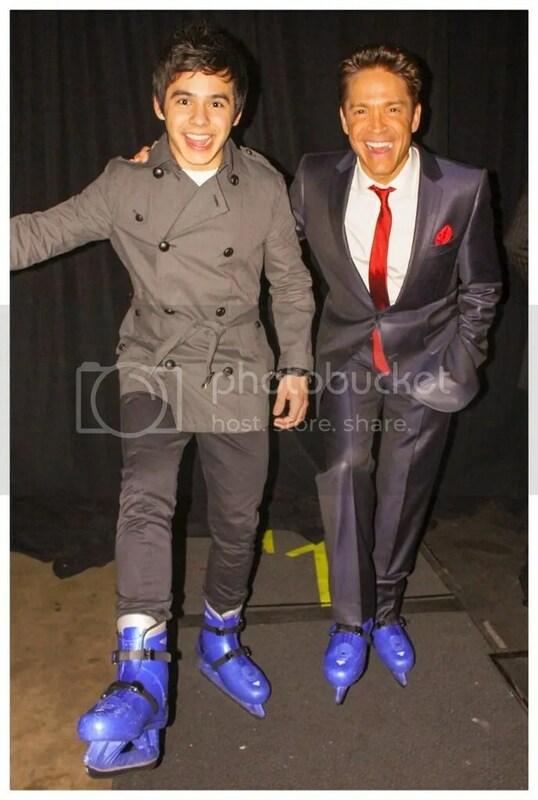 Could this be the same day David did the dougie? Just woke up and saw that I left my laptop on! Ahhh good reason to sit down and comment. 23. Bluesky, “Transfusion”! I’ll take it to describe how well David communicates with us. He is the great communicator of love ballads. Thank you for your comment! 27. A B R R A, So FS is in your top 5 from TOSOD. Didn’t know that! 31. Dayzee, Glad I was able to win you over! It’s so easy to happen with David’s songs. For me, songs that weren’t my favorites from the start (like YEDL), slowly become favorites, eventually. Dayzee, Tuesday nights are always a blast, but especially when you’re there! 32. Betsy, You remind me of me, a die-hard dog-lover for the longest time and wouldn’t give a cat a second thought, until I got one. LOL Now, I don’t think I could ever live without one! Jans is right, so many memories. I remember that night when you tweeted about hearing FS from Ruby Tuesday’s. ((((hugs)))) as you work out your health issues. I agree David needs some time for himself with his family. Fans have waited 2 years, they can hold on a bit longer while he decompresses. I would gladly give him the day of his return and grudgingly give him the first week. Thanks to all who keep us supplied with David related videos. They are the bestest. The pic of David with falling stars at the head of this article is delicious. 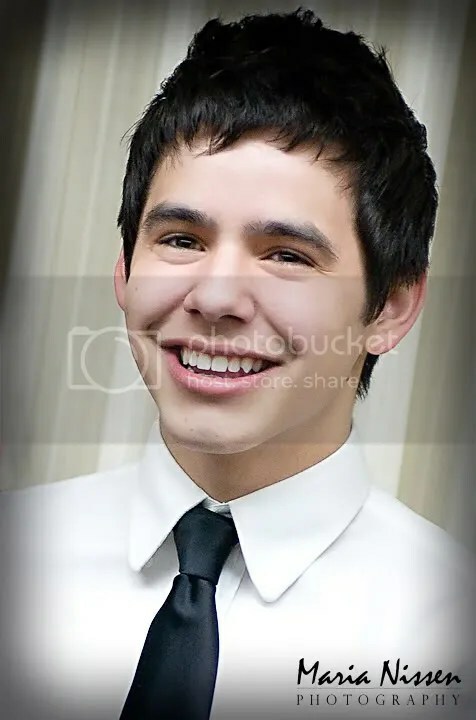 Fun blog from 2009 by Maria Nissen who got the chance to photograph David at a church Fireside. “This past weekend we had our semi-annual Stake Conference at church. 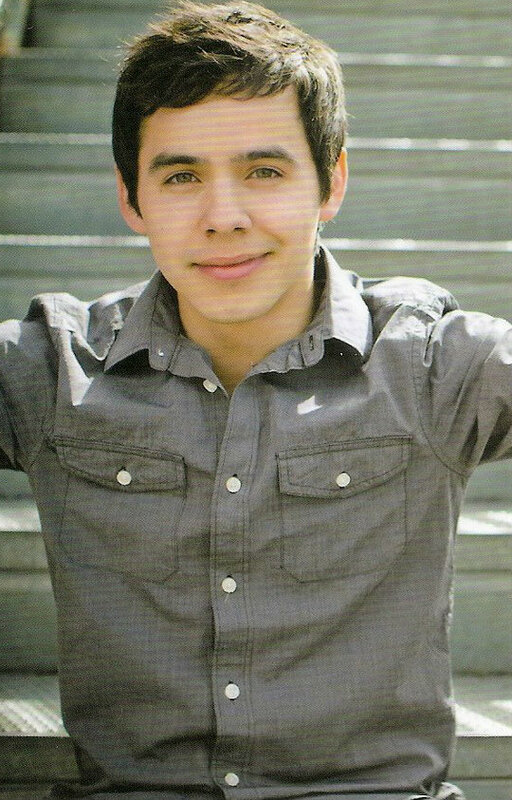 We were told Sunday morning that the special speaker for the youth fireside that evening would be David Archuleta. 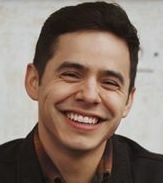 I admit that my first thought wasn’t how fun it would be to see David Archuleta, but of my brother, Andy, and my previously lost blog opportunity. Does it surprise anyone to know that a great majority of the audience was girls? It was fun just observe their enthusiasm for his imminent arrival. He finally came in a little after 7 p.m. sandwiched safely between President Robinson and President Wright, our Stake president. He looked like such a little guy. He IS a little guy! He seemed young and a little nervous. He was very cute. He sang 3 hymns, “I am a child of God” (lucky me-one of my favorites), “Be Still My Soul”(one of his favorites, when asked) and he ended with an a cappella rendition of “How Great Thou Art”. 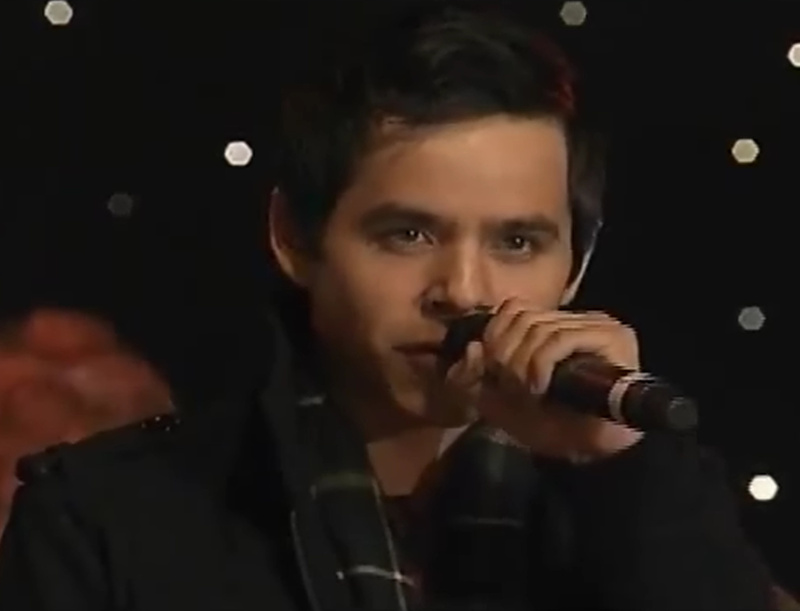 David singing NA with the crew sounds like an angel after hearing Aaron Paul singing the English version! 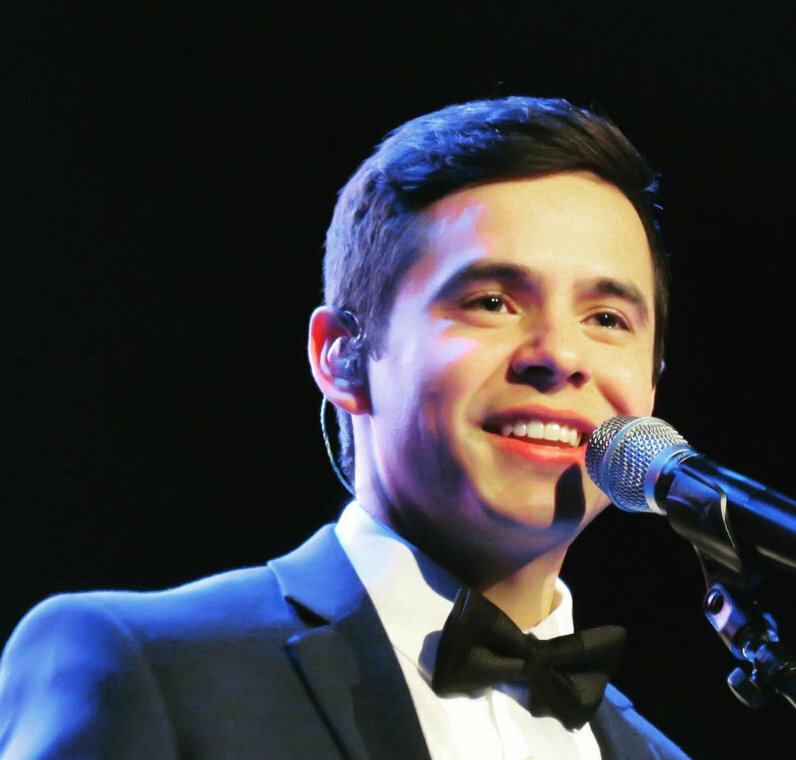 🙂 David has that extra special sound and makes everything he sings his own! 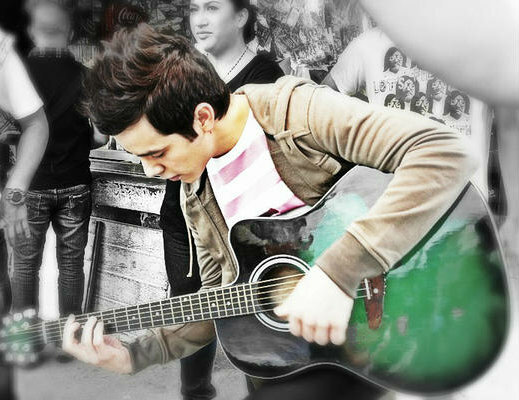 ♥ And for him to sing that in Tagalog just blows my mind! 36…Dayzee…I also agree for David to take time to unwind with his family. As long as we know that he’s safe and sound, what’s a few more days! I spoke with Pocoelsy last night on twitter DM. She is having computer issues and can’t get into the comments here. She thanks everyone for the nice comments on her videos! She loves us and misses coming by to read and comment. Steno, Hadn’t watched those videos in some time, thanks for bring them over! Angelica, yep, need is the right word. Ascpil, The “bubbletweet” was that a crazy time. I made an mp3 of that put in on my ipod and listened to it full blast in my car over and over and over haha. And I can’t believe Eman is following me on twitter! Any ideas on what I can tweet him? Bebe, Here’s another Falling Stars…sublime. WORLD WIDE TRENDING PARTY TONIGHT!!!!! This is way cool. 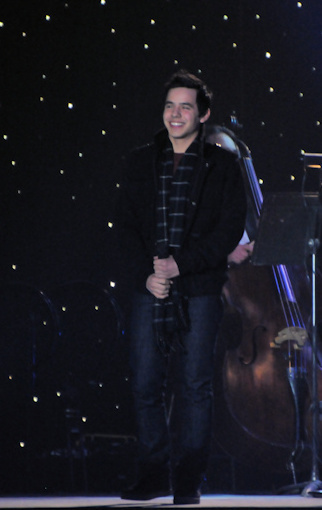 A David Archuleta update! Is the preparation for his return beginning??? Love what was said. Getting butterflies! I looked at Gayle122890 and wondered how come Gayle was using my password numbers. Oh yeah! We are all using those numbers. I had gotten so used to putting them into my computer I had forgotten their origin. For a minute. 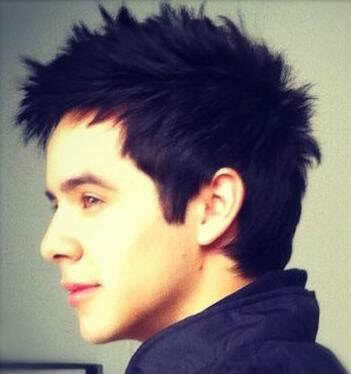 Abrra, you are still finding David pics I have never seen. Well done!